I named this blog chillimarmalade.com after the recipe I have been tweaking for the last year – the condiment I use the most of – my homemade chilli marmalade. This chilli marmalade recipe takes a hell of a lot of effort, a good hour of chopping and dicing the ingredients, and a ton of patience as the jam boils and bubbles down to a sticky glossy lava… but it’s so worth it. I love to eat chilli marmalade on a buttered crumpet, spooned into a creamy pasta sauce, stirred into a vegetable stirfry or simply scooped up with crackers and cheese. Mr Q eats chilli marmalade in his ham sandwiches most days. It’s also great as a dipping sauce – use it as you would a Thai-style sweet chilli sauce. Pop everything into a big pot and bring to the boil. Skim off the scummy bits that arise as you go. Simmer until sticky and jammy. Keep for six months in a cool, dark cupboard and refridgerate once opened. 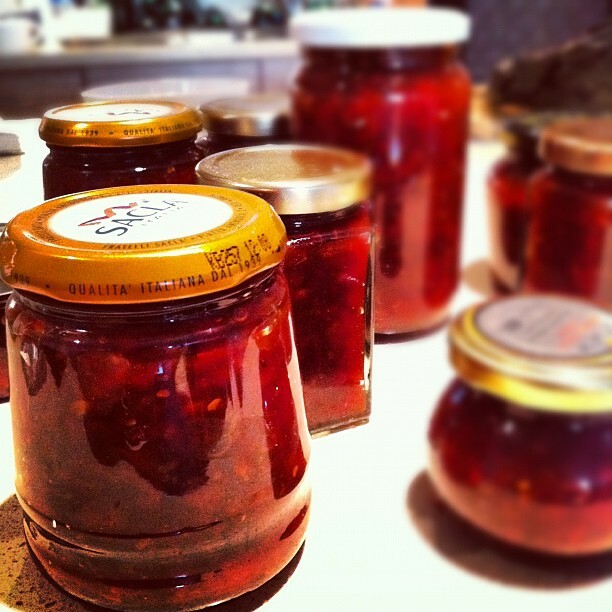 Make sure you enjoy a big dollop of this chilli marmalade on some crusty bread while it’s still warm! I tripled the recipe today, giving me 15 medium-sized jars. One for the fridge, plenty for my pantry, and a few to give away as gifts. Have you attempted making jam? What’s your favourite to have on hand? Tags: chilli, chilli jam, chilli marmalade, food, jam, marmalade, pepper, preserve, recipe, red peppers. Bookmark the permalink. I’ve also heard re: sterilising, that you can pop the jars in the oven, heats and dries them. Although I am no expert. Yum, this looks amazing. I am definitely keen to give it a try—someday when I have a kitchen of my own. 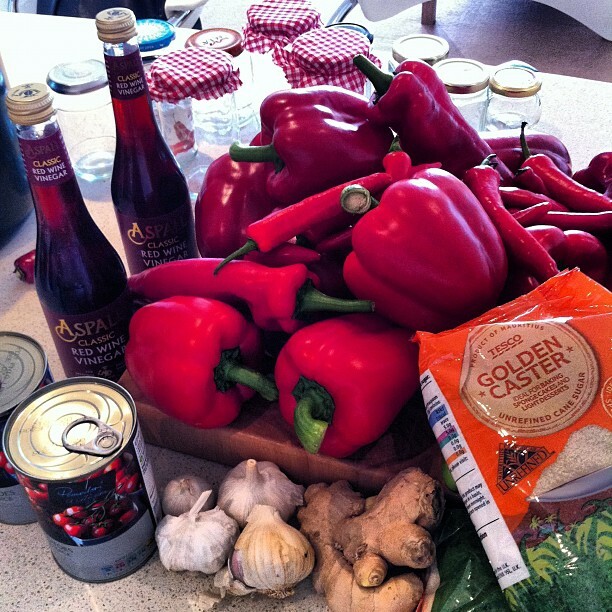 I love anything sweet chilli flavoured, as well as anything with figs in…nommm! Sounds amazing! Can’t wait to try this! What a great idea. 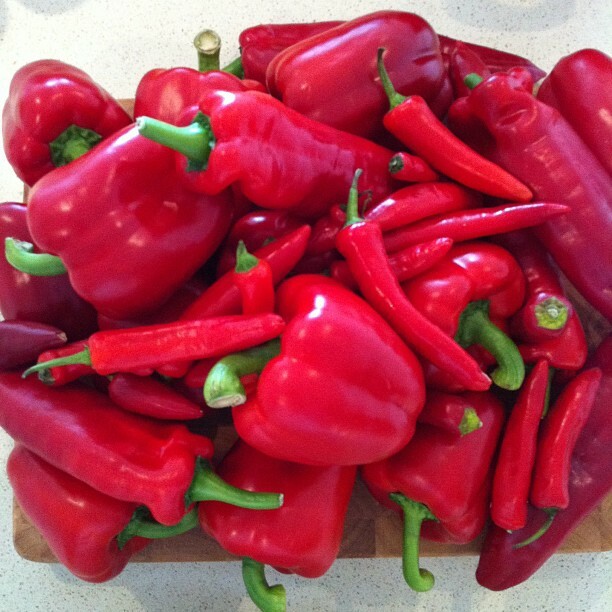 Your peppers look fantastic! I cannot wait to try this!! A couple of years ago, I made a spicy pepper jelly that we all loved, but I lost the recipe I used as a base and have never been able to find a recipe that I liked quite as well. I will definitely try this soon! Top recipe, roll on the summer for the next batch ! thank you for visiting my blog and leading me to this recipe! I know what I’ll be canning this summer. Stopped by to say thank you for following my blog and discovered this gem of a recipe – I absolutely love all types of chili sauces and jams. I am preparing to move at the moment but once I get settled I really want to start making some jams using all the summer fruit and veg and I think this needs to go on the list! Hi there, thank you for liking my post! Your chilli marmalade recipe looks so good. Great photos too. I’ll enjoy reading more of your recipes and kitchen adventures. I also like reading about your eating experiences in restaurants and your post about the picnic. You have a very nice and interesting blog! Oh wow…that chili looks scary hot. I love spicy food but it never occurred to me that chili could be marmalade. I like the idea of eating it with stirfry. Wow this looks delicious, definitely making some before long! Thanks for the recipe. Simmering away as I type, smells delicious and can’t wait to try it!! Thank you v m for your recipe. Tried this tonight. It was sensational, thanks for sharing.